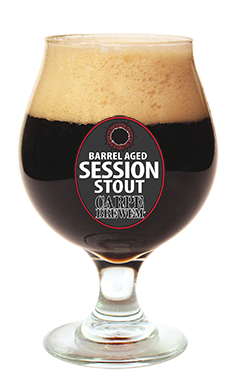 Barrel Aged Session Stout – Empyrean Brewing Co.
We love barrel-aged stouts, and we also love being able to drink more than one. This can be a challenge when the majority of barrel-aged stouts are heavy in alcohol. We solved this conundrum by crafting our Carpe Brewem Barrel Aged Session Stout. This low-alcohol stout features a full-bodied malt backbone highlighted with black and roast malts. The beer got a quick, 45-day dip in fresh bourbon barrels to impart a balanced oak and bourbon character. To top this creation off, we opted for nitro dispense — adding a creamy-smooth mouthfeel that holds it all together. It’s a beer you can enjoy more than one of!